I saw the Capri wasabi-flavored goat cheese when I was shopping at my favorite specialty store, Idlewylde farms. I was tempted to get it, but I figured I'd get it fresher if I went to their production facility near my home. Plus I could get pictures and do posts! At the shop/production facility, I asked about the cheese, wondering about the strength of the wasabi. They told me that the strength gets mellowed-out by the milk. 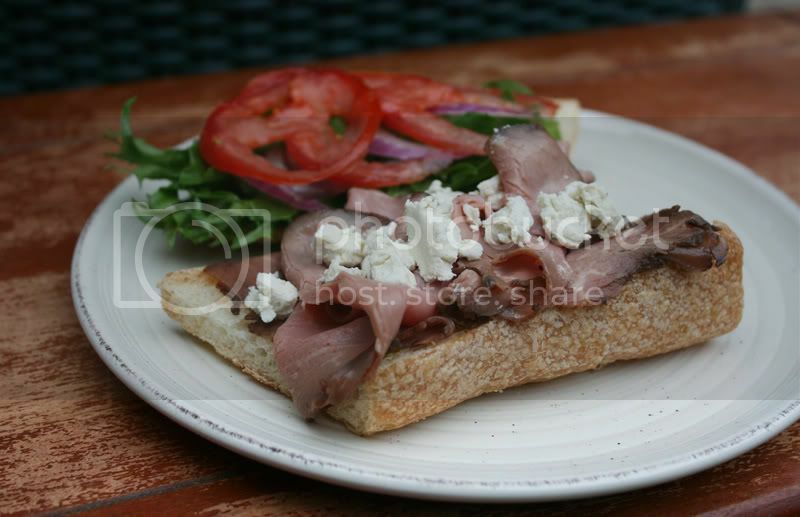 Mmm, a baguette, olive oil, roast beef, wasabi goat cheese, lettuce, red onion, and tomato. That's good stuff! Here's a link to my post about Westfield Farm and Capri goat cheese. It's worth a look!